We’d love your help. Let us know what’s wrong with this preview of Gluten-Free Murder by P.D. Workman. Erin Price moves to Eagle Falls, a place where everyone knows everyone as well as everyone else's business, taking over the store left to her by her aunt to start up a gluten-free bakery. The grand opening is marred by just one thing, the death of her business rival, Angela Plaint. It appears that Angela was poisoned by one of Erin's cupcakes, making her a prime suspect. Eq Erin Price moves to Eagle Falls, a place where everyone knows everyone as well as everyone else's business, taking over the store left to her by her aunt to start up a gluten-free bakery. The grand opening is marred by just one thing, the death of her business rival, Angela Plaint. It appears that Angela was poisoned by one of Erin's cupcakes, making her a prime suspect. To ask other readers questions about Gluten-Free Murder, please sign up. What started out as a great novel about an outsider coming home to a small town, turned into a great little mystery! Written with a languidness that matches the small town setting, this is a lovely beginning to what promises to be a great series. Couldn't put it down !! From a cute kitten to a police dog to a bakery for people with allergies ! Highly recommend! Great cozy myster and more. Wished I had read it sooner since I have had it for awhile now. Does a really really wonderful job of explaining gluten free and allergy in a simple way that all can understand. Even explains the types of flours used. Tells how food is not cardboard or tasteless. May be in future could include tips and recipes? Nice job with the time to simplify and explain the issue to us ordinary people. Now you probably could care less if gluten is not a problem for you and you want Great cozy myster and more. Wished I had read it sooner since I have had it for awhile now. The mystery is very well written. At the beginning I thought the main character was a little snippy but realize she is like me just says it like it is for her. Cannot wait to learn more about her in future books. Besides opening a gluten free bakery she brushes off an identity issue as of no importance. Bravo Bravo Bravo. I admit that I did not figure out who the bad person was. I was even routing for that character to around in the next book since I had someone else for it. Nicely done. Did not see it coming. I was very impressed with story because it showed the main character, Erin Price showing compassion for someone she didn't know, Vicky that needed help and in return they helped each other. Erin Price moves to Eagle Falls, a place where everyone knows everyone as well as everyone else's business, taking over the store left to her by her aunt to start up a gluten-free bakery. The grand opening is marred by just one thing, the death of her business rival, Angela Plaint who owns the other bakery in I was very impressed with story because it showed the main character, Erin Price showing compassion for someone she didn't know, Vicky that needed help and in return they helped each other. Erin Price moves to Eagle Falls, a place where everyone knows everyone as well as everyone else's business, taking over the store left to her by her aunt to start up a gluten-free bakery. The grand opening is marred by just one thing, the death of her business rival, Angela Plaint who owns the other bakery in town but doesn't work there anymore. It appears that Angela was poisoned by one of Erin’s cupcakes, making her a prime suspect. Read 'Gluten Free Murder' by P.D. Workman to my daughter as we were driving. I enjoyed the story as it is the kind of story you can read and not get overly distracted. Kind of a cozy Mystery. The characters were great and it did have a few plot twists and had some amusing moments. We spent quite a bit fun trying to figure out who done it. Was a great read and I would recommend it to anyone who like a nice light read. New town, New cat, New houseguest. This book was well written. The story flowed easily. The author included several twists and the ending was a bit of a surprise. Erin is an interesting character, as is Vic. I hope to learn more about their lives in later books. The town is a bit of a cliche, as southern Bible belt towns go, but is still pretty accurate. Hope you enjoy the book as much as I did. Didn't actually read the book myself but it was read to me as I drove on a road trip. Was a fun, kinda cheesey story with an added bit of mystery and murder. I liked the characters and the development of the story but there was a couple times I couldn't help but think "of course now thatis going to happen". But near the end I did find myself anticipating who commited the murder, which shows a good story. Would recommend as a quick, light and easy read. This is the first in the series. The main character is Erin who moves into town when she inherits a bakery and house from her aunt. She isn't given the warmest of welcomes and when the owner of the only other bakery is found dead in her basement from her allergies and Erin claims to be making allergy free bakery. It is interest to see how this all plays out. I didn't see that ending coming. Story about a woman named Erin, who aunt died and left her a store and house. When she moved back to the little town not everyone was happy she was opening a bakery! A good story! 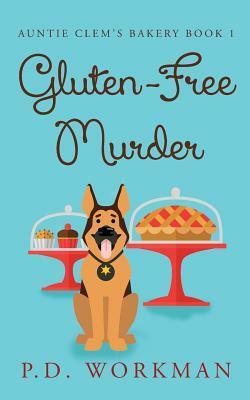 “Gluten-Free Murder” is a cleverly written whodunit with an even more ingenious solution. Good book and really liked the explanation of gluten allergy vs gluten intolerance. Liked the mystery part of the book too. Hated that it all of a sudden got very political and opinionated. Can’t we just escape all of that sometimes and just read a good mystery book? Received a free copy for a review. I liked the story and the characters. A great introduction to a new series. This was a good book and I enjoyed reading it. Looking forward to the next one. Only issue was the editing and how poor it was. I hope the next book is edited better. me. Look forward to reading more! Some typos early in the book but what a nice read for a dreary afternoon. Also, thanks for the freebies! A good solid mystery, likeable characters, a bit of sexual tension. What more could you ask for? A great beginning to a fun series! For as long as P.D. Workman can remember, the blank page has held an incredible allure. After a number of false starts, she finally wrote her first complete novel at the age of twelve. It was full of fantastic ideas. It was the spring board for many stories over the next few Award-winning novelist P.D. Workman writes riveting young adult/suspense fiction about mental illness, addiction, and abuse.